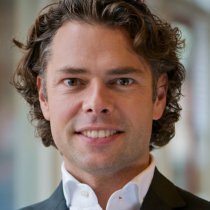 Han de Groot has invested in several start-up companies in the new media and financial services sector. These companies include QFLY.nl, the meta search engine for cheap flight tickets and PetPlan.nl, a leading provider of pet insurance, majority owned by AUV. Han also serves on the supervisory board of both PetPlan and QFLY. Han received a Bachelors’s degree in Business Economics from the Solvay Business School, University of Brussels (VUB/ULB), and a Master’s degree in Business Administration from the Erasmus University of Rotterdam (EUR).